From the very first Rose Bowl Game (known then as the Tournament East-West football game) pitting the University of Michigan against Stanford University, the Big Ten and Pac-10, two of the most dominant college football conferences, have been bitter rivals. Despite the geographical distance that separates the conferences, they have long shared similar values, such as a commitment to amateur athletics and racial diversity. With the state of college football in flux after WWII, these values and a shared vision of college athletics inspired a 1946 agreement between the existing incarnations of the Big Ten and Pac-10 conferences to send their respective conference champions to meet annually in the Rose Bowl. The two conferences are characterized by vastly different styles of football, often leading to criticism of the Big Ten as lacking nationally competitive teams and the Pac-10 as a top-heavy conference without much depth. USC, of the Pac-10, has dominated college football over the past decade with numerous Heisman Trophy Winners and National Championships. Over the past fifteen years, however, Ohio State has the best winning percentage in college football while USC barely breaks the top 10 at ninth. The Big Ten has experienced much more balance top to bottom, but has possibly lacked the same caliber of talent in skill positions, especially in the concentration that USC has enjoyed. The explosive offenses of the Pac-10 often fail to counterbalance weakness on the defensive side of the field, while the more balanced offensive style of the Big Ten is possible only as a result of stingy defenses. These contrasting strategies result in some of the most memorable battles of the college football season. 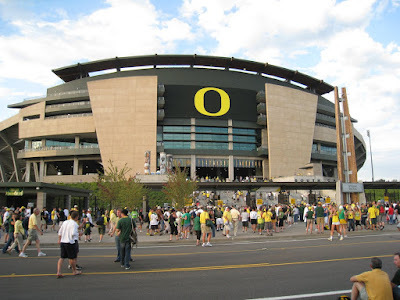 On September 12, 2009, the Purdue Boilermakers crossed the country for a rematch against the heavily favored Oregon Ducks of the Pac-10. The 2008 meeting in West Lafayette, IN was a memorable battle, with the overtime victory propelling the Oregon Ducks to an eventual Holiday Bowl victory in San Diego while the loss presaged a season of disappointment for the Purdue Boilermakers. With the highly rated Oregon Ducks entering the season as Pac Ten contenders and the Purdue Boilermakers rebuilding under new head coach Danny Hope, the expectations for the 2009 rematch were heavily skewed in favor of a dominating performance by the Ducks. 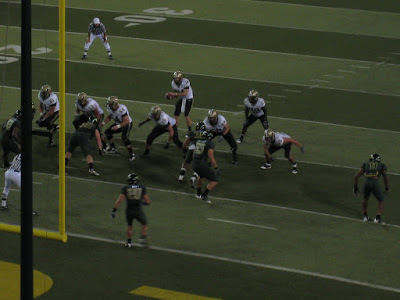 A solid win by Purdue in their season opener against Toledo followed an Oregon loss against a quality Boise State team in the opening game of the 2009 college football season. The Ducks were hungry for a statement victory and the untested Boilermakers from the Big 10 presented the perfect opportunity. The rematch in Oregon’s Autzen Stadium took place on a pleasant summer evening in Eugene, OR. While the summer warmth drifted away with the setting sun, the energy of the 58,000 fans was only beginning to heat up. First year Boilermaker head coach Danny Hope was anxious to prove that Purdue was back to its winning ways while Oregon was determined to show that their season wasn’t over with the loss of their star running back LaGarrette Blount, who was suspended for the season for punching Boise State’s Byron Hout after their season opening loss. The back and forth game, indicative of two evenly matched teams, was characterized by untimely turnovers by Purdue and backbreaking penalties on Oregon. Oregon scored first, going up 3-0 in the first quarter on a field goal, but the teams exchanged two touchdowns each before Purdue drove the field and kicked a chip shot to tie the game at 17 at the half. Despite the fact that the Oregon fans loudly proclaimed “it never rains in Autzen Stadium,” the intermittent drizzle seemed to come and go with the changing tides of the game. After Oregon returned the opening kickoff of the second half to midfield, the Purdue defense forced a fumble and the offense drove down the field to go up 24-17. Purdue would ultimately return the favor, throwing one interception for a TD and later fumbling the snap which was run in for another touchdown by Oregon. The intermittent drizzle had now become a pouring rain in perhaps an ominous sign for the Boilermakers. Purdue drove the field, scoring a touchdown in what looked to be another game tying performance, but they missed the extra point on a low kick that was partially blocked. After a few fruitless exchanges and some Oregon penalties, the Ducks had the ball on a 3rd and 20 deep in Purdue territory. The Ducks evaded numerous Purdue tacklers to go in and score giving them an eight point edge. Purdue nobly drove the field on the final drive of the game and scored on a 4th and 11 halfback pass giving Oregon only a 2 point edge. Purdue’s tight end caught the two point conversion in what would have set up a repeat of last year’s overtime game, but he stepped on the line in the back of the end zone giving the Ducks a two point win. The exciting Oregon versus Purdue matchup along with a come from behind win by USC over Ohio State may have given the Pac-10 the edge, but the highly competitive and exciting games leave little doubt that these conferences are evenly matched. As in all football games, the winner is often determined by who makes plays at pivotal points in the game. Purdue’s missed extra point, inability to stop Oregon on 3rd and 20, and numerous turnovers for scores gave the Ducks the edge they needed to pull out the win, but the excitement of the game was hard to beat.